I absolutely love this butternut squash ravioli because everyone in my family (myself included) thinks it is delicious! I know I am not alone on my constant mission to find healthy, well-balanced dinners that all four of us can enjoy together (I am not a fan of making separate meals). And the best part about this dish is that once you do the hard part, which is detailed below, you can freeze the uncooked raviolis. Think of those nights when you have no plan for dinner or better yet when you are going out and need something quick for the babysitter to feed the kids. What do a lot of moms do? 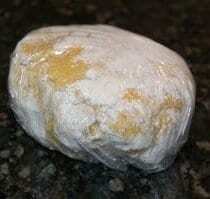 Throw some frozen chicken nuggets in the microwave for a few minutes. Now if you had some raviolis in your freezer, you could put forth almost the exact same effort by throwing a few in some boiling water for only 4 minutes (sans the sauce). Yes, that is all it takes for fresh pasta to cook…even when they start out frozen! Blend the eggs and flour together in a food processor (with dough blade), Kitchenaid mixer (with dough hook), or by hand with a fork. If using a processor or mixer, the dough will be one large ball chasing itself around the bowl when it is done. Freeze (do not refrigerate) leftovers on sheets of wax paper in a Tupperware container. Raviolis should not be touching and there is never a need to defrost…just throw the frozen ones right in the boiling water for about 4 minutes. This looks amazing! I so desperately want to start making meals from scratch. Maybe I will try this as my first attempt! :) I can just see myself making a huge mess though! Did it take several tries for you to get the ravioli’s as perfect as they are above? Could I still do this if I don’t have a ravioli cutter? I’m dying to try this!!! Yes, you definitely could! Just cut out round shapes with an upside down glass and then put a little water around the edge to help it seal when you fold over the circle into a half moon shape (with filling on the inside). You could also use a fork to help seal it. Good luck! how many ravioli’s does one batch make? approximately how big are they?thinking about giving this a go. 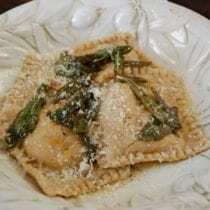 Oh I posted this recipe so long ago I can’t remember how many we ended up with, but the quantity varies greatly depending on the size of the ravioli. You can make them whatever size you want AND you can freeze the leftovers so if you end up with more than you need just save them for later! I hope that helps! I have never made my own pasta, but was given a pasta maker for a wedding gift (5 years ago!!). Thought I would attempt this recipe, sounds delicious! Do you boil all of the ravioli & then freeze it or can you just freeze the raw ravioli? You freeze the raw ravioli and then throw the cold frozen raw ones right into boiling water when you are ready to eat. So, I’ve been dying to try this recipe (I love butternut squash and get so excited about making good food for friends that is actually good for them!) and the only thing that wasn’t great was that it was difficult to get the pasta thin enough with a rolling pin…I felt like it might stretch on the counter and tear. Which leads me to wonder if maybe it would be REALLY AWESOME to own my own pasta machine…any thoughts of specific brands, etc? Is it possible to do this without a pasta machine. I would love to try making my own pastas, but the machine is not in the budget right now, nor anytime soon. You could, but would have to use a rolling pin and roll it VERY thin. Good luck! That is the correct weblog for anyone who wants to find out about this topic. You notice so much its almost exhausting to argue with you (not that I truly would want?HaHa). You definitely put a brand new spin on a topic thats been written about for years. Nice stuff, just nice! We made this last night! Without a pasta machine or a ravioli cutter. I’m certain my dough was not a thin as it’s supposed to be, but it was supoer delicious! After all the hassle I went through to get to the cooking stage, my husband actually said, “I don’t like ravioli.” I decided to only cook enough for me and my daughter. He came steal a bite and said, “That’s actually really good. Can you still cook some for me?” He said that the only ravioli he ever had came out of a can, so he thought that’s what they all would taste like. We made a ton a froze the rest. Question- Does yours “grow” when you cook them? I think I had to much dough on each one (no pasta machine! ), but when I boiled them they grew quite a bit! Glad they were a hit and yes the dough does expand a little when it boils/cooks. 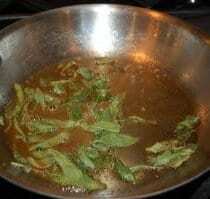 I am a nursing mom who really wants to try this recipie, but the sage in the sauce is known to dry one’s supply. Can you recommend some alternatives I could use to make a tasty sauce for this? Hi Heather. Perhaps you could just try a plain marinara sauce. Is this the same pasta recipe you use for other dishes, or just for ravioli? Oh, I so want to make these!!!!! 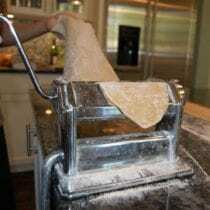 I have a mill and a bunch of grain and have always wanted to make my own ravioli but just never thought it would work (everyone so poo poo’s whole grain flour when I talk about doing it). Wow, you have so inspired me again. I made these today, SO Yummy! I made it without a pasta machine or ravioli cutter. I Used a pastry wheel, which looks just like your ravioli cutter. It works great! you could also use a pizza cutter. I have made my own pasta for years and I really like this recipe the best! The dough was so easy to work with!I am sure that i did not get the pasta as thin as you can with a machine, but it was still really good! And the butter and sage sauce was amazing and smelled so great cooking! I just wanted to make sure that for the butternut squash amount it is the entire butternut squash that weighs 21/2 lbs or just the “meat”? other online recipes give the squash amount to add but it seems like you are meaning the entire squash before it is gutted? I made this awhile ago, but the the pasta was too thick. So I tossed the extra squash in the freezer for another trial. several months later, while trying to dig up some baby food that I was hoping magically fell out of the container for my twins, I came across the squash. I was super excited to look up the ingredients to make sure the girls could have it, and they LOVE the squash! better get back to feeding them. Hi!! I cant wait to try this recipe, been wanting to learn how to make my own butternutsqush for years! Question though, I found 2 pounds of butternut squash in the store the other day, no shell, just the squash. Any idea how much I should use for this recipe? I was thinking I would just use a pound and go from there….?? Thanks!! any suggestions for a substitute for maple syrup? i am not a fan of maple syrup. thanks. Any recommendations for substitute for maple syrup? How many servings (or ravioli) does this recipe make? I’m cooking for 12. Should I double it? Would these be good served in regular (tomato) pasta sauce? I tried this recipe and for some reason my dough gets holes in it and kind of shreds apart! What did I do wrong?? I used the white whole wheat flour. This looks like the perfect recipe to try with the butternut squash that my husband bought. I’ve been staring at it for a while wondering what to do with it since I’m not generally a big squash fan. But this looks awesome and I think even my kids would like it. We are trying this recipe today. If I make them earlier in the day, is it ok to refrigerate them for a bit or would you leave them out? For the first try they were great. We need to get them a little thinner though. In the future, if I want to make them earlier in the day. Would you put them in the fridge or leave them out? Where do you buy sage? I’ve never tried it before? And do you know about how long it takes to complete step 5 once the dough has rested and is ready to go through the pasta machine? OK, so this was really not good- hardly edible really. The filling was waaaay too sweet, and the pasta was tough and grainy and blegh (pasta could have been an execution issue on my part). However, in a momentary stroke of genius, I poured too spicy vegetarian chili from the day before over the leftover filling and it was AMAZING. Like, literally one of the best things I have ever tasted. I have eaten it for lunch 5 days in a row now. I intend on attempting to develop a recipe to combine the two. I tried this recipe this evening and it turned out delicious!!! I tried to make these tonight and failed! I used a fork in a bowl to mix it up and my dough came out super sticky. How do I get it to stick to itself instead of everything else? You did not state how many servings this recipe makes. How many do you usually get out of it? Hi all. I made this for dinner tonight using regular while wheat flour. It was my first time making pasta. I thought the dough looked dry and uses my hands to mix as I don’t have a dough machine or pasta maker. The pasta was so yucky :'( we love butternut ravioli usually and I was so excited to try. Do u have any suggestions? I think it was too thick but maybe the whole wheat was too much? I froze the rest of the mixture and plan to try again. I would love anything to improve. Thank you! I love your recipes! Was wondering about a possible substitution for the eggs or different pasta recipe? My son has an egg allergy and we just don’t cook with eggs. 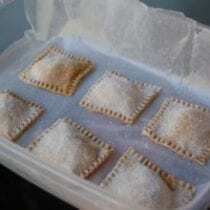 A good shortcut to making ravioli pasta is egg roll or wonton wrappers. There are vegan brands so there will be no egg! I’m pretty sure having a pasta machine would make your life easier when it comes to this recipe. As I do not I have to use a rolling pin…not fun! My pasta was just too thick but the filling was AMAZING! Is it possible to substitute olive oil for butter? I made the ravioli but haven’t tried the sauce yet. It was a fair amount of work but I think it will be worth it. This recipe sounds great! Will be making soon but…you should never brown butter. 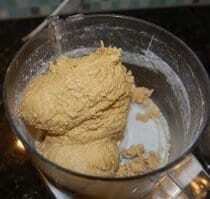 Browning butter is heating it past its smoke point, when this happens you are creating free radicals within your body. The evidence of free radical damage is all the brown spots (aka- liver spots) found on the hands, arms,and face as we age. The bigger and more spots, the more free radical damage done inside the body. Our family just made this in preparation for for our “MeatFreeMonday”. My husband who is our pasta maker was a bit dubious about using a different flour. (First time using whole wheat flour for him) but he commented that it was the easiest pasta making experience he had had. Our teenage daughter came over to help make the parcels and ended up eating the squash filling by the spoonful. We are now wishing we weren’t heading out for dinner but were trying the cooked results tonight. Hurry up Monday. 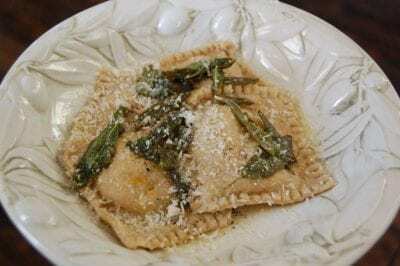 I tried this recipe and loved the filling, but my raviolis left something to be desired. I had only white flour, not sure if that has anything to do with it…I also do not have a ravioli ‘tool’, just used a pizza cutter to separate and a fork to seal. The raviolis were doughy and chewy…any ideas how I can fix it? The whole family enjoyed this delicious fall supper tonight. I wish this recipe had made the cookbook! Hubby and I made this tonight and to call it an epic failure is an understatement. We both were unsure about the dough, due to the recipe calling for only flour and eggs. We had everything on hand, so we gave it a try. I am not sure if I am more upset about the recipe failing, or the mess in the kitchen. After one bite, we spit it out and ordered pizza. I will try it again, but using my grandmothers recipe for dough. On a side note, if you don’t have the tool needed to fill the ravioli, you’re in for it. It makes life much easier and less messy. This definitely was a lot of work but well worth it. They came out great! I just made these, using 100% organic whole wheat flour for the pasta dough. I used my own pasta dough recipe, which called for less eggs also. I loved the butternut squash filling! I omitted butter and maple syrup but it was totally sweet, creamy and delicious. I also boiled cubed, peeled butternut squash instead of baking in the oven for shorter cooking time. It worked out great. It is quite a bit of work especially if you’re doing this alone, but outcome is worthwhile. I like to add chopped toasted hazelnut and crumbled blue cheese in the brown butter sauce. Yum! Hi! Just wondering if I used already pureed butternut squash how much would the recipe call for? I have frozen, pureed organic squash. Hi there. This is a good reference to have on hand: http://www.almanac.com/content/measuring-vegetables-recipes. I absolutely love this filling! The recipe for the dough is awful though. My dough came out way too sticky and was difficult to work with. I had to find other recipes to pinpoint what had gone wrong. Most pasta recipes seem to stick to one egg for one cup of flour, so there was way too much liquid in there. Like I said the filling and the sauce is amazing, but find another recipe for the dough. There are more detailed and better ones out there. I just found your site and look forward to trying some of your wonderful recipes. This is also the first time I used my KitchenAid ravioli maker, and I’m hoping that my mistakes and first-time experience will help others. The first mistake I made was to roll the pasta less than the width of the rollers causing the ravioli to have open ends. That is easily corrected by pressing the dough together and rolling it the full width the next time. The second mistake I made was to roll the dough too thick. I used the recommended setting of 3. Next time I’ll try 4 or 5. Here’s what I think I did right. After roasting the squash, I pureed it in my food processor, and then cooked the squash, butter, zest and cinnamon in a 3 quart sauce pan until most of the liquid was boiled off making a much less moist filling, and concentrating the flavor. After removing squash mixture from the heat, I added the remaining ingredients to the saucepan and stirred them together. I also “simmered” the pasta to cook it. It’s the same temperature as boiling, but is much gentler on the pasta. The ravioli was amazing!!! Thanks for this tasty, and fun, recipe. They were absolutely delicious!!! I used my own dough recipe but the filling and sauce were fantastic. Can you freeze the extra filling?